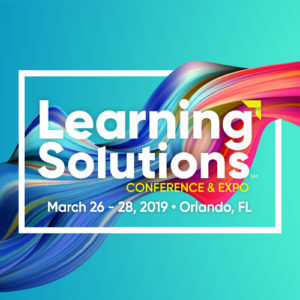 The Ixxus team is headed to Learning Solutions 2019 in Orlando, FL (March 26 – 28) and we hope to see you there. Ixxus is a subsidiary of Copyright Clearance Center (CCC). Learning Solutions Conference & Expo provides attendees with real solutions to create new strategies, increase engagement, and leverage the power of learning technologies. Modern learning & development (L&D) organizations make it a priority to improve employees’ skills and enhance knowledge—not yearly or monthly, but continuously. These successful organizations have moved away from disconnected, rigid courses and instead enabled flexible, multi-purpose, agile learning content. By ensuring that their learning content is rich, dynamic, and personalized, they provide their teams with the tools to drive their own learning. As a result, the value of every content asset is maximized, and production is streamlined. But many organizations struggle to find a way to enable this dynamic learning. Oftentimes learning content is stored in silos, making it difficult to find and reuse. Reviewing and updating courses is time-consuming, creating derivative courses is problematic, and version control is a nightmare. Distributing learning content in multiple formats (SCORM, PDF, ePub, HTML, XML, etc.) requires painstaking rework. Sound familiar? Adopting a Learning Content Management System (LCMS) can help resolve these challenges by removing content silos; enriching your content assets to make them more discoverable and reusable; streamlining the course development, editing, and review processes; ensuring courses meet quality standards; and enabling team members to easily publish learning content across multiple channels. Join us to learn how the right Learning Content Management System can benefit your organization and your employees. Please stop by the Ixxus booth (#517) and say hi. We’ll be exhibiting throughout the conference, and we’re eager to talk to you about your content development and management challenges and how our Learning Content Management System can help. Follow the conversation from Orlando at #LSCon, and connect with CCC on Twitter, Facebook and LinkedIn for information about this event, learning content management and more. Robert Gaggin is a Senior Product Marketing Manager at Copyright Clearance Center (CCC) responsible for go-to-market strategy and execution, and marketing programs in support of the Information & Content Services business unit. He contributes to the development, management, and marketing of CCC’s licensing and content management services for the learning market, including higher education, K-12 and corporate learning and development. Robert previously held marketing and editorial positions at Pearson, Cengage, and CISION. Stephen Casbeer is a senior technology and business transformation specialist who has extensive experience with content operations, content management and delivery systems, and a wide range of editorial and production technologies. He has led global organizations and advised executives on adapting to and benefiting from rapid change in the information industry, encompassing issues of business and technology strategy, process re-engineering, and organizational design.